The Great Neoliberal Lie is one of the most egregious modern day examples of the "big lie" propaganda technique in action. 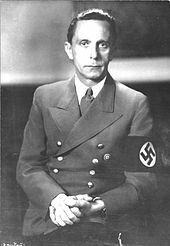 The Nazi propaganda minister Joseph Goebbels defined the big lie technique as "when one lies, one should lie big, and stick to it" and that "if you tell a lie big enough and keep repeating it, people will eventually come to believe it". The state has spent too much on infrastructure, healthcare, education and welfare and has borrowed excessively to pay for it, creating the budget deficit and increasing the national debt. The only way to to reduce the deficit is to cut government spending. The first fault in the theory is that the economic crisis and subsequent rises in government debts were not caused by excessive government borrowing, they were caused by reckless lending in the financial sector. 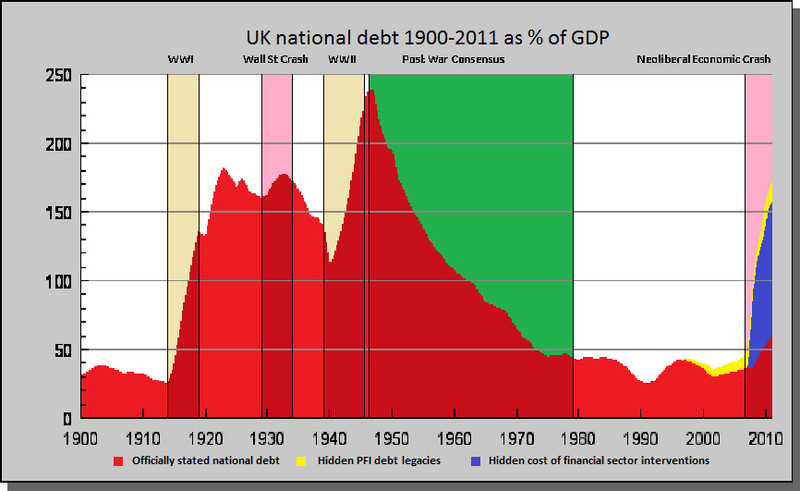 To take the UK as an example, between 1997 and 2008 the UK national debt actually fell from 41.92% of GDP to 36.25%. During the same period British banks lent ever increasing amounts to less credit worthy customers in the form of 3.5x and 4.5x mortgages, banks' investments in household debt rose from around 60% of GDP to above 90%, and their leverage ratios increased as ever growing numbers of people chose to take out loans in order to invest in the property market rather than invest in savings or private pensions. Several of the worst affected British banks even chose to invest £billions in buying up sub-prime mortgage-backed debt securities such as Collateralised Debt Obligations (they were AAA rated but anyone diligent enough to actually check what they're buying would have seen that CDOs were worthless neoliberal economic diarrhea). Much of this reckless lending was facilitated by successive government deregulations of the financial sector and seemingly deliberate government policies aimed at fuelling house price inflation. Anyone attempting to maintain that the economic crisis and the huge rises in government debts were caused by excessive government borrowing as opposed to reckless lending in the financial sector and unsustainable property price inflation, is either lacking sufficient economic knowledge to understand the causes of the crisis or is deliberately attempting to obfuscate the actual causes of the crisis by switching cause and effect. The next problem with the Great Neoliberal Lie can be found through closer examination of what actually constitutes government debt. UK national debt as % of GDP since 1900.
from official debt calculations, PFI debt lagacies in yellow & bankers' bailouts in purple. To take the UK as an example again, as of July 2011 the proportion of government debt spent on infrastructure, healthcare, welfare, education, pensions, the military, policing, the justice system, prisons, local services, roads, government subsidies, EU contributions, science funding and research, international aid and even a few ill advised foreign invasions and occupations amounted to £876 billion (58% of GDP) which is actually well below the 20th Century average, not bad considering the tremendous economic impact of the credit crunch. The headline figure of £876 billion (58% of GDP) is actually extremely misleading because the government chooses to exclude huge chunks of debt from the calculations. These artificial exclusions are designed to mislead, but what they actually do is make it very easy to compare the "legitimate costs" of running the state with the cost of following neoliberal economic policies. The first of these artificial exclusions is the amount of government spending diverted through neoliberal economic alchemy schemes called PFI. Gordon Brown began the policy of hiding this proportion of government expenditure "off balance sheet" in order to prevent government borrowing passing his arbitrary 40% of GDP "golden rule". Despite pre-election Tory promises these hidden liabilities have not been brought back on balance, meaning that an estimated £240 billion (15.9% of GDP) in uneconomical, inefficient and inflexible PFI debt legacies remain hidden. The next, and by far the biggest of the misleading exclusions is the cost of "interventions" to save the UK financial sector from collapsing into the black holes of debt they had created for themselves. UK Government borrowing to fund bailouts and the nationalisation of failed banks amounts to an incredible £1,376 billion (91% of GDP). This astonishing level of borrowing doesn't even take into account the severe economic damage inflicted by the Bank of England policy of printing money (quantitative easing) and holding interest rates artificially low, neither does it take into account the $trillions in secretive low interest loans made to British banks by the US Federal Reserve. These figures show that "legitimate" state borrowing to fund all manner of useful infrastructure and services is absolutely dwarfed by borrowing to artificially prop up the dysfunctional UK financial sector and to facilitate neoliberal economic alchemy schemes. The neoliberal experiment in deregulated banking has been an abject failure and the UK government should be looking to impose "austerity" on the financial sector and on wasteful and inefficient PFI scams long before it turns its attention to minimising the legitimate costs of statehood. The next problem with the Great Neoliberal Lie is the short-termism of large scale across the board cuts in state investment, which in many cases will create transparent false economies. There are so many potential examples here I'm going to limit myself to brief discussion of just two general areas of state investment, policing and education. The first, (and probably the simplest) example can be seen in the UK coalition government proposal to sack up to 40,000 police officers in the name of "austerity". This policy alone could be seen as potentially economically damaging but aligned with policies of cutting social services, slashing benefits and eliminating charity funding, all against a backdrop of increasing unemployment and rising poverty levels, it looks like a recipe for massively increased crime rates. Increased crime rates as poverty and lack of alternatives drive people to crime and a gelded police force become overwhelmed would lead to spiraling insurance costs. More examples of false economies can be seen the coalition government's education policies. The decision to inflict huge budget cuts on university funding and scientific research look like an extreme economic disincentive for high-tech industries considering whether to base themselves in the UK. Borrowing £4.5 billion per year to pay out £9,000 loans to 487,000 students will only add to the public debt problem in the short term and continue the squeeze on disposable income in the long term as graduates have loan repayments deducted from their salaries. It has been estimated that huge numbers of graduates will end up paying this "aspiration tax" for their entire working lives, as unless they have wealthy parents to pay the fees for them any graduate earning under £42,000 a year will not even be able to cover the (inflation +3%) interest rates on the loans. Lumbering students that decide to study at English universities with such massive debts has already been criticised as an economic disincentive to higher education and a tax on aspiration, but it could also lead to a significant "brain drain" as the potential industrial pioneers and business leaders of the future should be smart enough decide to study for equivalent qualifications elsewhere in Europe, where they would be entitled to free university education, or via the payment of nominal registration fees. Lastly, and in my opinion most importantly, the biggest criticism of the Great Neoliberal Liars is the way they completely disregard numerous historical precedents in making the fundamental assumption that cutting state spending is the only way to reduce government deficits. There are several notable examples of states using targeted taxation, intelligent regulation and increased government spending in order to boost the economy out of recession, allowing them to address government debts in the long term. Thus showing that paying down government debts in the short term is not the only way to reduce state deficits and that stimulating the economy in order to pay down debts once prosperity returns is a successfully tried and tested methodology and a viable alternative. Probably the most famous example of "tax and spend" is Franklin D. Roosevelt's New Deal in the United States which resolved the post Wall Street Crash depression through policies such as; reform of the financial sector (closing the banks down entirely until they agreed to proper regualtion), wealth taxes, the initiation of huge state funded infrastructure projects, a massive reduction in unemployment, large scale house building and the repeal of prohibition. These measures pulled the United States out of recession while maintaining a carefully balanced budget (until America joined the Second World War). six fold reduction in the UK national debt. The second World War increased the US national debt from around 40% of GDP in 1940 to over 100% by the mid 1940s, however the cost of the war was felt even more seriously in the United Kingdom as the British economy was still suffering the legacy of public debts built up during the First World War as they entered the Second World War. By the time it was over the British national debt stood at 237% of GDP. In the immediate aftermath of war the Labour party were elected and began implementation of the Post War Consensus as envisaged by William Beveridge. The fundamental policies included the establishment of universal healthcare which was to be "free at the point of delivery", the strengthening of the welfare state, massive housebuilding schemes and the nationalisation of key industries to create a "mixed economy". The Post War Consensus lasted until the late 1970s and saw the national debt fall from 237% of GDP down to 43.7%. 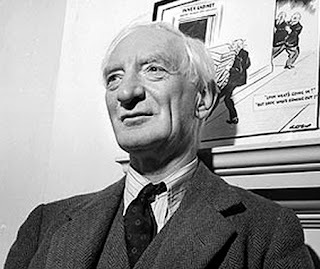 During the period 1946-1979 the wealth gap closed significantly, unemployment fell to very low levels, the living conditions of the poorest improved dramatically, ordinary working people had more disposable income than in any other period in history and the economy boomed despite the gradual loss of the British Empire. It was such a success that many elements of the Post War Consensus were imitated by democratic governments across the western world. economic recovery via targeted taxation and state investment policies. The most recent example of "tax and spend" leading to dramatic economic recovery and national debt reduction can be found in Argentina. Throughout the 1990s Argentina were considered IMF poster boys because of the enthusiastic manner in which they implemented hardline neoliberal economic reforms such as deregulation of the financial sector, privatisation of almost everything, lack of fiscal autonomy, low taxes and low government spending. Between 1999 and 2002 the Argentine economy imploded spectacularly with four consecutive years of economic contraction and hyperinflation eventually resulting in the biggest national default in economic history. Between 2002 and 2010 Argentina instituted a number of "tax and spend policies" aimed at reducing capital flight, improving national infrastructure, stimulating housebuilding and reducing unemployment. In this period the Argentine economy grew at an average of 9% per annum and Argentine national debts have been significantly reduced, despite strenuous efforts to bring down their unorthodox recovery from the IMF, international markets and numerous vulture funds. 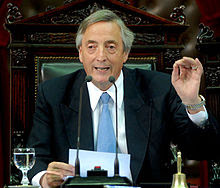 The IMF's intransigence led former Argentine President Néstor Kirchner to complain that the IMF has transformed itself "from being a lender for development to a creditor demanding privileges". The "austerity lovers" that repeat the Great Neoliberal Lie have created a revisionist history in which they switch cause and effect. The deficit is not the cause of the economic crisis, in fact the deficit is only growing so rapidly because the real economy is shrinking in the wake of the financial sector crisis the neoliberals triggered with their deregulation mania. The hidden debt figures show that the state has borrowed far more in order to hand it out to the banks than it has borrowed to spend on infrastructure and services, meaning that any sensible course of action would involve imposing strict regulation and austerity measures on the financial services industries in order to recover the bailouts and prevent them from being gambled away on the unregulated derivatives markets, paid out in excessive pay and bonuses or squirreled away into tax havens. The austerity loving revisionist would have us believe that the cause of the economic recession is that the government has spent too much on employing policemen, funding scientific research, providing universal healthcare and maintaining a social safety net to protect those that lose their jobs or become too old or ill to work, even though this interpretation is completely undermined by their own evidence. The tried and tested methodologies for resolving debt crises are targeted taxation, intelligent legislation and increased government investment in order to boost the economy. Once the economy is thriving the deficit can be addressed. Current neoliberal policies of cutting taxes for the rich, further corporate deregulation and the slashing of state investment are just a continuation of the militant neoliberal economic policies that created the economic crisis in the first place. The concept of targeting deficit reduction through the slashing of state investment as a principle and over-ruling priority, is an unfounded ideological stance based on the faulty assumption that cuts are the only option. Our politicians feel free to implement ideologically driven and assumption riddled policies based on falsified national debt statistics. Cuts that looks set to intensify the effects of the global economic meltdown rather than alleviate them. This is an absolute outrage. The only way such brutal cuts in areas such as education and policing can be justified is through a denial that these services provide economic benefits of their own. It seems like common sense that a low crime state with an highly educated populace would be better equipped to recover from an economic downturn than a high crime state with a poorly educated populace, where the most intelligent students are actually incentivised to leave the country altogether by a localised aspiration tax. Apart from repeating the Great Neoliberal Lie another tactic of the unthinking right-wing reactionary is to use the pejorative term "deficit denier" to describe anyone that opposes their favoured "slash and burn" economic policies. In proposing tried and tested economic solutions as an alternative to ideologically driven and unproven neoliberal small-statism, the opposition are not denying the deficit. In fact they are pointing out that austerity is far from the only option, and that prioritising deficit reduction above wider economic recovery may intensify the economic crisis and harm the economy in both the short term and the long term, making it much more difficult to reduce government debts. Unless political leaders are prepared to accept that targeted taxation, regulation of the financial services sector and state investment are proven strategies for economic recovery and a long term reduction in government debts, they should be considered as dangerous ideologues pursuing an experimental and unproven economic strategy. By borrowing over a trillion pounds in order to sink it into the dysfunctional financial sector instead of using it to fund direct investment in infrastructure projects, provide high quality education and services as well as providing low interest direct support to struggling industries, UK politicians were tearing up the economic recovery textbook in order to continue their slavish adherence to a dysfunctional neoliberal system. In deciding to slash government spending rather than concentrate on stimulating economic recovery the Tories are risking the future economic prosperity of the UK in order to give "more of the same" hardline neoliberalism yet another chance. Another Angry Voice is a not-for-profit page which generates absolutely no revenue from advertising and accepts no money from corporate or political interests. The only sources of income for Another Angry Voice are small donations from people who see some value in my work. If you appreciate my efforts and you could afford to make a donation, it would be massively appreciated. What is ... the Marginal Propensity to Consume? What is ... Fiscal Multiplication? Who is to blame for the economic crisis? What is ... the difference between a debt and a deficit?